Instant messaging on mobile phone is possible through some 3rd party apps like Fring and for Yahoo messenger in blackberry but now Nokia has launched a beta version of an instant messenger which works only in a few E-series mobile phones. While multitasking in your phone, you get background notification for any new IM you receive. 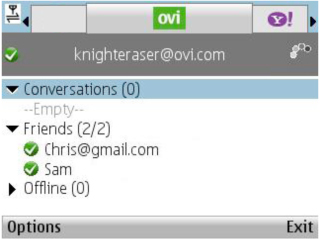 This beta is available for Nokia E75, E71 and E63, and it works with Yahoo!® Messenger, Google Talk and Ovi accounts. Check out more at Nokia Beta Labs! im getting an error message on startup for the Nokia IM Beta for Nokia E63…??? Pls, i cannot chat on my mobile phone.can u assist me in dion tha .i use MTN line 08035608764.